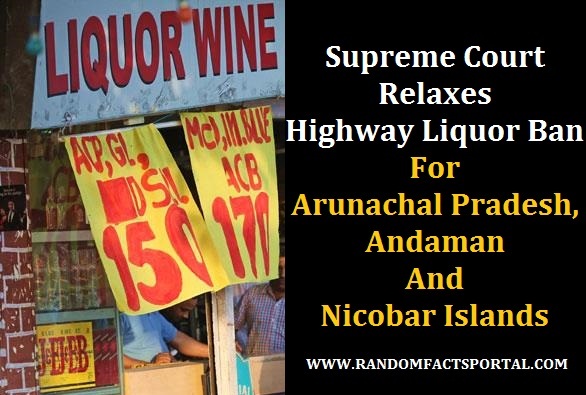 The Supreme Court on Wednesday exempted Arunachal Pradesh and Andaman and Nicobar Islands from the 500-metre highway liquor ban on Wednesday. Uttarakhand had also submitted an appeal for relief from the ban but the apex court directed the state government to submit data to substantiate its plea. For the two states that have been given relief, the court has restricted the ban from 500 metres to 220 metres. The petitions were heard by a bench of Chief Justice J S Khehar and Justices D Y Chandrachud and L Nageswara Rao. As the ban led to thousands of interlocutory applications (IA) being filed, the court had said in the last hearing that the issue was not that easy to tackle as the parties wanted. The court had said that IAs will only be allowed from state and no other party. It had also said the only relief is review. In a previous hearing, the counsel appearing for Arunachal Pradesh had said that the court had exempted Sikkim and Meghalaya and argued that the represented state was even higher than them. He had said that there were no state highways in Arunachal Pradesh due to fund shortage and there are only national highways. He added that the state had more forest cover than Sikkim and Meghalaya and that there were only 1,020 places to drink. The counsel had argued that the ban had closed down 960 of them. The state’s counsel argued that the ban will mean complete effective ban in two districts in the state and added that as the state is flood prone the liquor vends are located on the periphery of national highways.